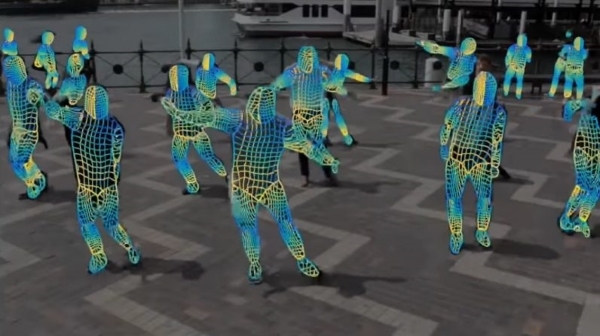 The end result is an AI that uses a 2D RGB image as input and applies it to any number of humans in a video. Instead of putting a celebrity’s face on someone else’s body, you could change the way people look in a video as if editing a Minecraft skin. Of course there are applications for this that go far beyond turning celebrities and movie characters into nudes or Wookies. An AI with the ability to isolate multiple humans in a video and apply targeted 2D image maps could be extraordinarily useful to law enforcement. It could, potentially, be adapted to extract all the humans from footage of a crowd and create a searchable index by, for example, body language or suspicious movement patterns. According to the team’s white paper, the AI also has its sights set on the gaming industry. With some more work and optimization, it could one day be a substitute for character modeling in video games. And it could be the key to creating realistic augmented reality characters for people to interact with in real-time. Still, it all adds up to a world where Meryl Streep and Nicholas Cage’s jobs could soon be just as at-risk as the cashiers’ at McDonalds.